The gunman who opened fire Friday in a deadly attack at the airport in Fort Lauderdale, Florida, pulled his weapon out from an unlikely place in this post-9/11 era of tightened airport security and pat-downs by the Transportation Security Administration — his checked luggage. The shooting unfolded in a crowded baggage claim area of the airport, after the gunman's flight had arrived in Fort Lauderdale and he had retrieved his checked bags, officials said. The suspect, Esteban Santiago, was accused of killing at least five people and wounding at least eight others, the authorities said. According to the TSA, passengers at the nation's airports are allowed to transport unloaded guns in their checked baggage. The firearms must be kept in a locked "hard-sided" container, and gun owners must declare firearms and any ammunition to airline representatives when checking the bags at ticket counters, according to the agency's firearm regulations. Guns, real ones as well as replicas and toys, are allowed to be transported only in checked baggage, not in carry-on luggage. The same is true for clips, firing pins and other firearm parts. The shooting has shed light on a rather obscure aspect of U.S. air travel. Airport security experts said the practice has not been a cause of concern for law enforcement officials, and gun-rights advocates defended it as safe and said Santiago's actions did not represent the majority of gun owners who travel with their weapons. Gun-control supporters said the shooting raised questions about the efforts in some states, including Florida, to allow gun owners to carry firearms inside passenger terminals in airports, but it was unclear if the shooting would lead to calls for the TSA to tighten firearm regulations. Kevin Murphy, the executive director of the Airport Law Enforcement Agencies Network, a nonprofit group that represents law enforcement agencies that protect airports, said the practice of transporting weapons in checked bags had become routine. 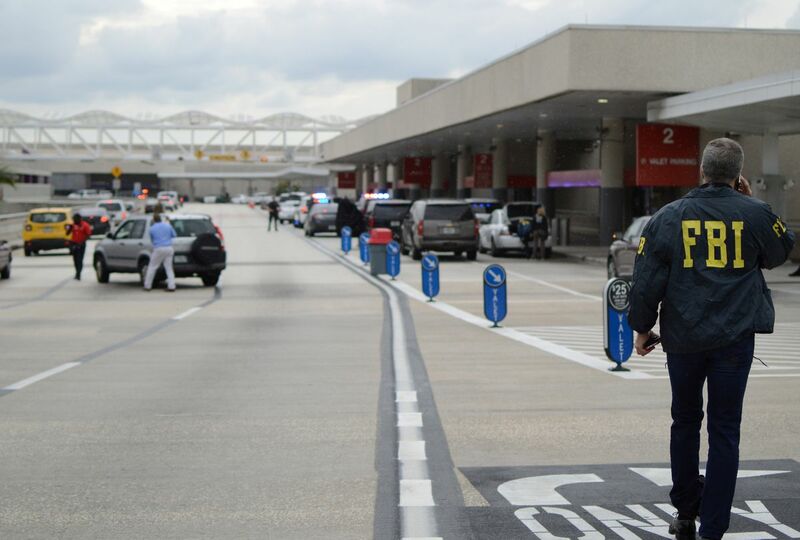 "Federal regulations allow the carriage of firearms in checked baggage," said Murphy, the former police chief of Cincinnati/Northern Kentucky International Airport. "Since there are so many states that allow the concealed and open carry of firearms in the nonsecure side of airport terminals, the carriage of firearms in checked baggage poses the same level of risk as any public building in which carrying firearms is allowed." Jerry Patterson, a former Texas land commissioner and gun-rights supporter who wrote the state's concealed-carry law, said he had carried shotguns, rifles and handguns in checked bags for years when traveling. "I carry a gun in checked baggage every time I fly," Patterson said. "Lately, it's become very routine at the airline counter and very professional by TSA and airline staff. What would I tell a person surprised about carrying a firearm in a checked bag? I would ask them if they'd rather I'd keep it in my carry-on bag." It was unclear if Santiago, who was arrested, was allowed to carry a handgun in Florida and if the gun was legally purchased. The motive for the shooting remained unclear, though federal law enforcement officials said Friday that Santiago might have been mentally disturbed. In many cases, air travelers are not required to show any registration or paperwork for the firearm. The declaration required by the TSA often amounts to travelers' signing a tag or document declaring that the firearm is not loaded. The shooting occurred just four weeks after a Republican lawmaker in Florida filed a bill to expand gun rights in the state, by allowing people with concealed-carry permits to carry their firearms inside airport passenger terminals and in other areas, including college campuses. Current state law allows guns inside passenger terminals, but only if the guns are inside locked cases for checked baggage. The bill would still prohibit the carrying of guns through security screening. The lawmaker, state Sen. W. Gregory Steube, and gun-rights proponents said the bill was a public-safety measure meant to increase the number of places where law-abiding gun owners could carry their firearms. Gun-control advocates appeared ready to use the shooting in their efforts to defeat that bill and others like it in the Florida Legislature. "Floridians have the right to be in an airport, a nightclub or on college campuses without the fear of possibly being gunned down," said Michelle Gajda, a leader of the Florida chapter of Moms Demand Action for Gun Sense in America, adding, "Today should serve as a reminder that guns have no place in such areas in our communities." Various airlines have different limits on the carrying of firearms in checked bags. United Airlines, for example, accepts guns only from travelers who are 18 or older and permits ammunition to be packed in the same container as the firearm or a separate one, but no more than 11 pounds of ammunition is allowed. On United flights, the firearm is transported in a section of the aircraft that is inaccessible to the passenger.